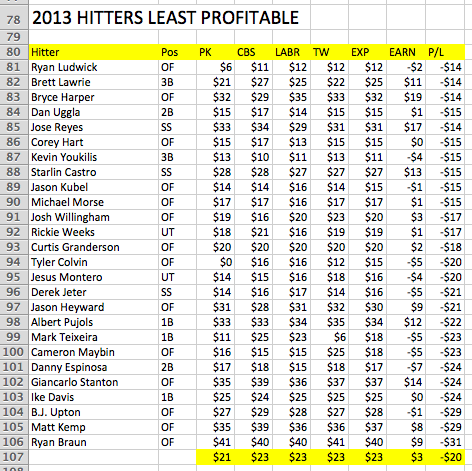 Yesterday we looked at what hitters cost last year and how they performed, which told us something about what we can expect from our drafts. 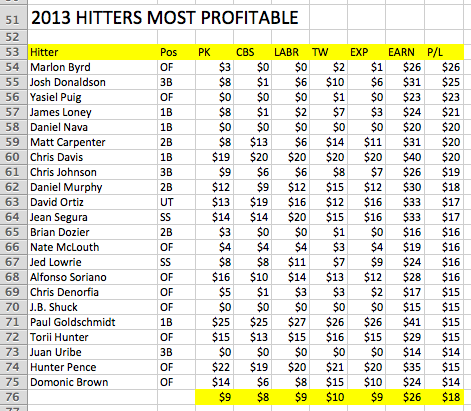 An average team in 2013 lost 12 percent of its hitting value from auction day to the end of the year. That’s money that had to be made up somehow during the season. One of the ways to make up for the pretty much inevitable auction failures is to draft guys who make big profits. These obviously aren’t the blue-chip players we pay $30 or more for, because they cost too much to earn big profits usually. We’re happy to pay for and receive all the stats they provide when things go right. The Biggest Profit chart gives an idea of where these extreme bargains can be found on auction day. These guys averaged $9 in the auction, but only Jed Lowrie cost $9. In fact three of them cost $20 or more, five cost $10 to $19, and seven cost $1 to $9. When you’re down in the single digits it’s pretty hard to make the case that selecting these guys was a skill more than flat out luck. I might have gone to $3 on Brian Dozier, as I said you should in the preseason, but by the time these spots come up situations play a much bigger role than actual bid prices. Who makes the buy is as much a lottery ticket as anything. This is even more true with the five guys who weren’t bought at all. Was it really skill to choose Juan Uribe or JB Shuck, or was it a desperate shot in the dark? Credit for selecting the more expensive players goes to those who chose them. I was a loser here on Chris Davis, Matt Carpenter, and Paul Goldschmidt, I didn’t see them coming, and a winner on Hunter Pence, I did see him. I also saw Domonic Brown, too, almost, but in Tout Wars I stopped at my bid price ($4 higher than the consensus price) and lost him to Phil Hertz. Damn him. The most overpriced chart shows the reverse dynamic. Who was bid up and then failed utterly? These guys were generally pursued, aggressively for the most part, and then failed. We have big names, $30+ guys, like Ryan Braun naturally (what a jerk), and Matt Kemp, Jose Reyes, Giancarlo Stanton, Albert Pujols, and Jason Heyward. When these guys get hurt, suspended, or fail, the pain piles up in a hurry. The big issue here is how we assess injury risk. Avoiding the seemingly injury-prone seems like a difference maker, but was it reasonable to avoid Matt Kemp and Giancarlo Stanton last year knowing their talents and capabilities? I had both rated at a price that would not win them, which was smart. Same with Pujols and Jeter, but not Jason Heyward. And there’s the rub. We also have to deal with the random failure. BJ Upton, Ike Davis, and Danny Espinosa just stunk, without prior warning. Consider them the stink bomb in your parade. Was there a way to avoid them? This entry was posted in Data, Looking Back, Prices. Bookmark the permalink.